Ting Ting, one of three Malaysian Sun Bears currently at the Oakland Zoo, plays in his hammock (Nicole Vermeer). WHERE IT IS: Near Mills in the East Oakland Hills. WHY IT’S COOL: The park focuses on wildlife conservation and restoration through its educational signs that dot the paths. For example, in front of each cage there is a graphic stating the animals’ endangered status and sometimes notes taken by the keepers on certain animals’ behavior. One of the Oakland Zoo's elephants parades around its enclosure (Nicole Vermeer). DON’T MISS: The featured exhibit, “Wild Australia,” which opened July 3 and runs all through the fall. Note that it’s only accessible via the miniature train, which costs an additional $3.00 with admission. Another extra thing to do that costs $3.00: the ski lift that features a twenty-minute aerial tour of the Zoo and an exclusive view of the Bison Elk roaming the upper hillside. WHAT TO BRING: Cash for the extra cost of rides, a bottle of sunblock and some good walking shoes. EXACT ADDRESS & ADMISSION: The Oakland Zoo is located at 9777 Golf Links Road off Highway 580, which is accessible via AC Transit bus line 46, which transfers from line 57. The entrance fee is $12.50 for adults, $8.50 for children age 15 and under. Group discounts are available. A view of the City of Oakland from the Lake Marritt Boathouse (Nicole Vermeer). WHERE IT IS: On the North side of Lake Merritt, at the edge of Lakeside Park. A flock of Oakland ducks tour the waters of the Lake Merritt Boathouse (Nicole Vermeer). WHY IT’S COOL: For an affordable rate, you can rent various boats including paddle boats, kayaks, and sailboats. Life jackets and other necessary gear are included in the rental price. From your boat ride on the lake, you can see many of Oakland’s historical buildings, including the Public Library and Masonic Temple. DON’T MISS: According to Interim Maintenance Coordinator Alex Johnson, the best time to go sailing on the lake is in the late afternoon, when the wind picks up. He recommends the “Capri,” a sailboat which is ideal for beginners. Near the boat house is a wildlife refuge – the oldest in the country – that was designated in 1870, according to the City of Oakland website. After the boating, the nearby Lakeshore Drive and Grand Avenue are home to many locally-owned shops and eateries. WHAT TO BRING: Leave your costly electronics on the shore! Many are lost in the lake, according to Johnson. If you are going to be operating your own boat, comfortable clothes are also recommended. Hourly rentals range from $8 to $15. Meredith McDougald helps Aiyanna McDougald, 1, ride a merry-go-round at Children's Fairyland (Lauren McDougald). 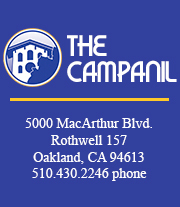 WHERE IT IS: Located on the Lake Merritt Peninsula, near the Lake Merritt Boathouse. WHY IT’S COOL: Children’s Fairyland is the first theme park in the country dedicated exclusively to parents with small children. According to the Children’s Fairyland website, the park inspired many copies after it was built in the 1950’s, including Walt Disney’s Disneyland. The park’s rides and exhibits are scaled to fit the average pre-schooler. According to the website, the park features the longest continually-running puppet theater in the country, which recently celebrated its 50th anniversary. One of many Alice in Wonderland characters on display at Children's Fairyland in Oakland (Nicole Vermeer). DON’T MISS: There are miniature rides, including a Ferris wheel and a train. There is also a small petting zoo featuring guinea pigs, donkeys and alpacas. WHAT TO BRING: A child. Unfortunately for some Mills students, adults are only allowed in with children, but if you are a parent, aunt, or godparent, or take care of someone’s children for money, Children’s Fairyland is the ideal spot. EXACT ADDRESS & COST: On the shore of Lake Merritt at Grand Avenue and Bellevue. The cost is $7 for everyone, regardless of age.